This past year has been very successful for our company, all thanks to our great Legacy Family Tree users - you! Our company (Millennia Corporation) celebrated our 26th year in business, and the 13th year since we first released Legacy. We also traveled a lot this year (49,106 miles), but it wasn't as much as last year (about 50,000 miles). We attended conferences, seminars, and user group meetings in Arizona, California, Utah, Washington, Iowa, British Columbia, Quebec, Idaho, Ontario, Colorado, Texas, Oregon, Missouri, Tennessee, Australia, and New Zealand. Our biggest success of the year was the introduction of our free online seminars (webinars). One of the webinars had live attendees from 50 different countries. The year started off with our announcement and release of Legacy 7.4, which added new FamilySearch integration tools. We also gave away the first of many netbook computers at the Arizona Family History Expo and had fun at conferences all year long meeting our customers and giving away great prizes, including copies of our Legacy software. My most expensive purchase of the year was my $15,500 puppy. Thankfully they called me back the next morning informing me that my credit card was overcharged by about $15,000. This year was the year of the Legacy User Group. New groups were formed in Fresno, California; North Carolina; Tarrant County, Texas; Paraguay; Greeley, Colorado; Des Moines, Iowa; Kansas City, Missouri; and Qualicum Beach, British Columbia. Thanks to all of the new group leaders for helping organize and educate. In May, the Mozy 2.0 backup software was released. I still cannot believe how many emails we receive from devasted computer users who did not have a backup of their files. All their pictures, genealogy files, financials - gone. With backup software like Mozy (I'm sure there are lots of other good ones too) you never have to worry about your next hard drive crash. Mozy is free for up to 2GB of data - certainly enough space for all your Legacy files. At the Southern California Genealogical Jamboree in June, I noticed there was a drawing for a year's subscription to GoToWebinar.com. I had been thinking about using this technology to broadcast live, online Legacy classes for you. Tickets for the drawing were $5 each, and I did not see very many tickets in the jar. So I bought eight of them. For the first time in my life I actually won something. So with this $6,000 annual subscription that we won, we can now offer free, unlimited webinars to you at home. I'm certain we'll "re-subscribe" next year as these webinars have been one of the most successful things we have ever done. August was an exciting month for genealogy software on mobile devices. The Families genealogy software made its deput for the iPhone, iPod Touch, and iPad. It synchronizes with your Legacy Family Tree family files. Then, Pocket Genealogist 4 was announced for the Windows Mobile devices. It, too, synchronizes with your Legacy files. Finally, on August 25 we quietly celebrated this blog's 5th blogiversary. When I graduated from BYU I thought my days of writing were finally over. Today's blog article (the one you are reading right now) is our 900th article since 2005. And even with my dry, and often dumb humor, it still gets read by thousands every day. Thanks everyone! Perhaps our company's biggest advance in education technology came with our first-ever webinar in September, Mapping Software for Genealogists. We've left this one in the archives. Registration was actually over-booked less than two days after its announcement (there is only room for the first 1,000 attendees). I have always wanted to personally visit the home of every Legacy user throughout the world to give them one-on-one guidance, but with this technology, now I can. The Legacy video training CDs are, of course, still valuable, as they give you an entire series of the learn-to-do-it-right-the-first-time advice and guidance. Since then we have held eight additional webinars and already have great ones planned for 2011. My favorite month of the year was October. It started off with Jim Ericson's FamilySearch Indexing webinar where attendees from 50 different countries were present. Two weeks later, I was scheduled to teach a live workshop to a small classroom of students at the West Valley Genealogical Society in Youngtown, Arizona. With their cooperation, we tested the limits of technology by, at the same time, broadcasting the class to a live webinar audience around the world. The pinnacle of it all was when we took live calls - we had callers from France, England, Ohio, and others. I wish you all could have seen the faces of the students in class - they were as amazed and "tickled" as I was for the experience. Later that week, after DearMYRTLE's fantastic webinar on Blogging for Beginners, Karen Clifford spoke to a live audience at the ICAPGen (International Commission for the Accreditation of Professional Genealogists) seminar and broadcast her Evidence Analysis class to our live webinar audience as well. But I'm not very excited about all this...can you tell? Not much happened in November...except for our What's New in Technology webinar with Paul Larsen, our Heritage Collector Suite software webinar with Marlo Schuldt where we announced version 6 of their photo organizing software, and I think something else happened....Oh yes, I remember now...we left for our 7th annual Legacy Genealogy Cruise to Australia and New Zealand. FamilySearch Indexing announced that they had surpassed 160 million indexed names in 2010, making my 63,580 indexed names seem trivial, but every indexed name means a once-lost-ancestor might be more easily found for someone. December was also a big month for us. Two more great webinars - Janet Hovorka's Sharing Your Family History with Legacy Charting and Katie Gale's Helping Unlock the World's Records - FamilySearch Indexing for Power Users. Google Earth 6 - who doesn't use it - was announced by Google. FamilySearch announced big changes with their website. We announced the long-awaited release date of Legacy 7.5, and finally we announced our 2011 Legacy Genealogy Cruise to New England and Eastern Canada. As 2010 comes to a close, we are happy with the progress we are making as a company. We have developed a great plan for 2011 and beyond. One more thanks to the entire genealogy community for all you do to help genealogy progress. Happy New Year to everyone! The 8th annual Legacy Genealogy Cruise, to be held September 29-October 8, 2011, starts and ends in New Jersey, and visits the following ports: Cape Liberty Cruise Port, New Jersey; Portland, Maine; Bar Harbor, Maine; Saint John, New Brunswick; Halifax, Nova Scotia; and Boston, Massachusetts. We will sail on Royal Caribbean's Explorer of the Seas ship. Lighthouses aren't the only reason people found their way here. New England and Eastern Canada have an unmistakable charm, rich history and natural beauty all their own. And there's no better time to visit than the fall - when the foliage is brilliant in every imaginable color, lighthouses dot the coastline, and there's always an authentic lobster bake going on somewhere. On the days we are at sea attend the Legacy Family Tree genealogy classes and learn the real secrets to becoming an expert with Legacy and improving the way you do your research. Go home with the knowledge and tools you need to be more successful than you ever thought possible. You will be learning directly from the experts. Last cruise's classes were recorded for each of the students so they could replay them at home. There's never been a cruise ship like Royal Caribbean's ship Explorer of the Seas. Enjoy one-of-a-kind features like an ice-skating rink, the Royal Promenade and a rock-climbing wall. There was only one way to accommodate all of these innovative ideas. We built a bigger cruise ship. The 138,000-ton, 3,114-guest Explorer of the Seas offers more space for every guest - plus enhanced staterooms, expanded dining options and exceptional recreational facilities. This cruise ship is so high-tech, it even features the University of Miami Ocean Lab, a state-of-the-art oceanographic and atmospheric science lab. For class descriptions, frequently asked questions, descriptions of the places we'll visit, or pictures of our past cruises, visit http://www.legacyfamilytree.com/CruiseInfo_2011.asp. Here are some screenshots of 7.5. On January 17, 2011. Watch our blog at http://news.legacyfamilytree.com for the announcement, or simply check the Updates section on the Legacy Home tab inside Legacy 7. The new-look FamilySearch website now has some new records to match. Nearly three million new digital images were posted this week, helping family historians researching their ancestors in Canada, Spain, Venezuela, and the United States. The U.S. Social Security Death Index is also a new addition to the site, with over 7 million indexed records. You can search all of these records and more at FamilySearch.org. FamilySearch International is the largest genealogy organization in the world. Millions of people use FamilySearch records, resources, and services to learn more about their family history. To help in this great pursuit, FamilySearch has been actively gathering, preserving, and sharing genealogical records worldwide for over 100 years. FamilySearch is a nonprofit organization sponsored by The Church of Jesus Christ of Latter-day Saints. Patrons may access FamilySearch services and resources for free online at FamilySearch.org or through over 4,600 family history centers in 132 countries, including the main Family History Library in Salt Lake City, Utah. While the live webinar is not until Wednesday, February 2, 2011, space is limited to the first 1,000 attendees, so register today to reserve your virtual seat. Registration is free. Learn how to document the daily life of your ancestors in over 300 years of fragile, rare newspapers, books and documents. See how you can click and read articles about your ancestors, obituaries & marriage notices, military reports and even the sermons preached at their funerals! History comes alive as you climb beyond the names and dates on your family tree to the recorded details of their lives. Join librarian, lecturer, newspaper expert, and GenealogyBank.com's Thomas Jay Kemp for this one-hour webinar on U.S. newspaper research, including a demonstration of the historical newspapers, books, and documents available at GenealogyBank.com. Thomas Jay Kemp, Director, Genealogy Products NewsBank, inc. A well-known genealogist, librarian and speaker for over 30 years. He is the author of more than 30 books. Registration is free but space is limited. 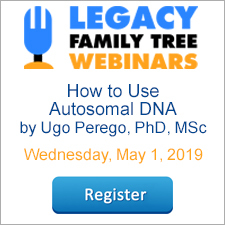 Click the registration below to reserve your webinar seat. Click here to calculate the time for your time zone. After you register you will be sent instructions, including your private link to view the webinar online. You will need to be connected to the Internet (high speed connection recommended) and turn on your speakers. You can also join via telephone to listen to the presentation. Using a headset works best (but is not required) - here's my favorite. Be sure to join about 15 minutes prior to the start time to ensure everything is working correctly. Also be sure to correctly calculate your time zone. Registration is now open for a fantastic upcoming webinar: Chasing Women - Finding Your Female Ancestors. Hosted by Legacy Family Tree's Geoff Rasmussen and presented by GenealogyBlog.com's Leland K. Meitzler, you are in for a real treat. While the live webinar is not until Wednesday, February 16, 2011, space is limited to the first 1,000 attendees, so register today to reserve your virtual seat. Registration is free. Last week I, along with other genealogy bloggers, was invited to participate in FamilySearch's first-ever "bloginar" (a bloginar is a webinar for bloggers...), similar to our Legacy webinars. The intent of the bloginar was to advertise and demonstrate two things: the upcoming RootsTech conference in Salt Lake City and the new features at FamilySearch.org. We recently published information about the new design of FamilySearch. In this bloginar, FamilySearch developers gave us an inside tour of all the new features, including the brand new Family History Library Catalog (FHLC). The recording of the bloginar is now available to view, although I think they forgot to click the "Record Now" button until about 15 minutes into the presentation. But that is when it got really good. Click here to view the recorded bloginar. It is just over an hour, but well worth your time. The following article is written by my friend, Tom Kemp, of GenealogyBank.com. I use their website constantly for my newspaper research - both for historical newspapers as well as today's as I search for obituaries. We've now partnered with GenealogyBank.com to bring our Legacy Family Tree users a discounted rate for their content. Genealogists are hungry for details about the lives of our ancestors, information that can only be found in newspapers. To get to know our ancestors better—the lives they lived, their hardships and triumphs—you need to know their stories. For that kind of information, nothing beats an archive of historical newspapers. Today there are thousands of newspapers online, from big cities and small towns all across America, easily searchable on the Internet. Newspapers have been published in the U.S. since 1690. The great thing about newspapers is that most are published every day, providing information that gives genealogists the crucial details necessary to document every member on the family tree. Newspapers are essential to family history research, as the following two stories illustrate. The Ayres family lived in Westchester County, New York, in the mid-nineteenth century. Census records provide important information about this family, but don’t tell the entire story. Tragedy struck the family in 1848, as we discover only by digging deeper into some old newspapers. The 1850 Census for Greenburgh, Westchester County, New York, listed James Ayres (born in 1817) and his wife Ann (also born in 1817). The Census also listed their three children: James H. (born in 1842), Sarah (born in 1844), and Frederica (born in 1849). Looking at this family closely, we see that there is a suspicious five-year gap in the ages of the two youngest children: Sarah is 6 and Frederica 1. These gaps are often the most difficult to research—and yet often turn up the most interesting and poignant family history. You can’t rely on census records alone to find every member of a family, or the family’s complete story. Death was something people in 1850 were all too familiar with. The life expectancy was only around 39 years. Infant mortality was shockingly high—roughly 22 out of every 100 live births died as infants. Is there an Ayres family tragedy that the above record does not reveal—was there a child born that had died before the 1850 Census? Newspapers provide the answer, revealing a painful part of the Ayres family history. In the Dec. 12, 1848, issue of the Hudson River Chronicle (Sing Sing, New York), there is an obituary notice for the daughter of James and Ann Ayres: Lovina Ayres, who was born Aug. 7, 1846, and died Nov. 26, 1848. Now, notice these dates: 1846 to 1848. Little Lovina was born and died in between the census years; she was gone before the 1850 Census began recording the names of every member of the Ayres family. And so, her name was never recorded in a census. Without the account in the Hudson River Chronicle this little girl might have been omitted from the Ayres family history. The Hudson River Chronicle gives us not only the fact that Lovina was their child, it gives us the actual poem that the parents chose to remember her by. For a brief moment we are standing there in the home—feeling the grief of our ancestors as they lived it. Newspapers not only fill in gaps in census records, they provide intimate family details that humanize genealogy research. Imagine if the Ayres were part of your family tree and you found this newspaper notice. Suddenly, you’ve come to know something about their lives; you’ve shared their grief, holding onto the image of the smile on Lovina’s lips as their darling two-year-old girl passed away. They’ve become part of your family. Your family tree is just not complete without the details that are readily available in newspapers. As this story illustrates, newspapers are an essential tool for documenting American family histories. One of the key sources for online newspapers is GenealogyBank.com. Featuring more than 4,600 U.S. newspapers with over 1 billion names from all 50 states, GenealogyBank is one of the most extensive online historical newspaper archives available anywhere, designed specifically for family history research. Over 95% of their newspaper content is exclusive to GenealogyBank. By providing access to rare and hard-to-find newspapers from 1690 to the present day, GenealogyBank gives researchers the opportunity to discover unique, long-forgotten information about their American ancestors. 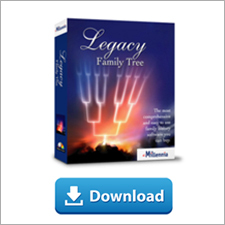 Special Offer for Legacy Family Tree – Join Now and Save Over 75%! For a limited time, annual memberships are at their most affordable if you join before December 30th, 2010. For only $4.66 per month, you’ll save over 75% off the monthly rate and over $180 a year.